In 1968, the world got a glimpse of the future. A young, nervous sounding researcher sat in front of a computer workstation: a small visual monitor above a desktop with a typewriter keyboard in the middle, one smaller key pad with various light-up buttons to the left and to the right a clunky black box which the user could move to point at and interact with specific objects on the visual display. Presenting live in front of computer professionals at the Fall Joint Computer Conference in San Francisco and a series of cameras recording the presentation, the researcher demonstrated the fruit of nearly a decade’s worth of work from the Augmentation Research Center at the Menlo Park, California, Stanford Research Institute. The project being unveiled, NLS (or the on-line system), was a ground breaking computer system introducing for the first time many of the computer interface features we are familiar with today: the point and click mouse (that clunky looking black box), a functional hypertext system dynamically linking files to one another within the computer’s memory, the ability to collaborate with other individuals on the same screen via networked computers and much more. Douglas Engelbart was the young computer scientist and the presentation is known as “The Mother of All Demos.” Despite its groundbreaking nature, “The Mother of All Demos” is largely forgotten outside the realm of computer science and Douglas Engelbart is far from a household name. The NLS was never commercialized, and by the time general consumers experienced many of the features developed for the NLS, the entire paradigm of computing had shifted—from large, expensive computers only available at large institutions such as universities or corporations and shared by several users to smaller (and less powerful) personal computers. However, the work completed at the Augmentation Research Center is undoubtedly some of the most influential research ever completed in the field of Human-Computer Interaction (HCI). Several of the researchers from the project would go on to develop the foundation of the personal computer paradigm at Xerox PARC, the influential Palo Alto research center, thus heavily influencing the personal computing revolution that began in the early 1980’s (Grudin 2008). And Engelbart’s research agenda seeking to use computers to augment human intelligence is still very much alive and well in research labs around the world today. In this essay, I aim to examine some of the foundational works in the HCI field. According to Jonathan Grudin, former Editor-in-Chief of ACM Transactions on Human-Computer Interactions and one of the leading voices in the field, HCI includes research in four main areas: human design factors, information systems, computer science and library & information science (Grudin 2012). A comprehensive survey of HCI—including hardware development, input/output technologies, the software that brings it all together and the resulting new media produced by an ever expanding pool of computer users—is impossible in a paper of this scope. This essay also leaves out a discussion of many of the early theorists responsible for developing the general use computer—including Alan Turing, John von Neumann, and others—and the information theorists whose work laid the foundation for the digitization of information—most notably Claude Shannon (although Shannon’s fingerprints can be found in this paper, as he advised Ivan Sutherland’s work on Sketchpad, which will be discussed at length). Instead, I will focus on the work of a select few of the field’s most influential thinkers, using their research as a lens through which to explore the early development of HCI in the first few decades following the invention of the digital computer. After reviewing this history, I will evaluate the field’s successes in reaching the goals set by these visionary thinkers. Finally, I will examine some current and emerging research trends that might fulfill some of the as yet unachieved goals with the hope of maximizing the future consumer benefits as computers continue to become increasingly pervasive throughout society. Today, computers of nearly all shapes and sizes surround us. The average CCT student likely rarely spends a waking moment beyond arms reach of some sort of computational device. And with the realities of Moore’s Law—which stipulates that the number of transistors on an integrated circuit will double roughly every two years, but which can also be used to describe patterns of decreasing cost, size and availability of many technologies developed in the computer era (Grudin 2012)—our interaction with and uses of computers will only continue to grow in the coming years. The need for an improved manner of interface between human and computer was obvious. When the transition from vacuum tube to solid-state, transistor based computing made computers cheaper and more reliable, it also opened up new possibilities for human interaction. The machines no longer demanded a team of engineers just to function. While this was a great advance in the ease of computing, it only put more emphasis on the need for better systems to ease the pains of interaction so that computers could be useful to less savvy operators (Grudin 2012). Luckily, early visionaries in the HCI field had already started thinking about this problem. 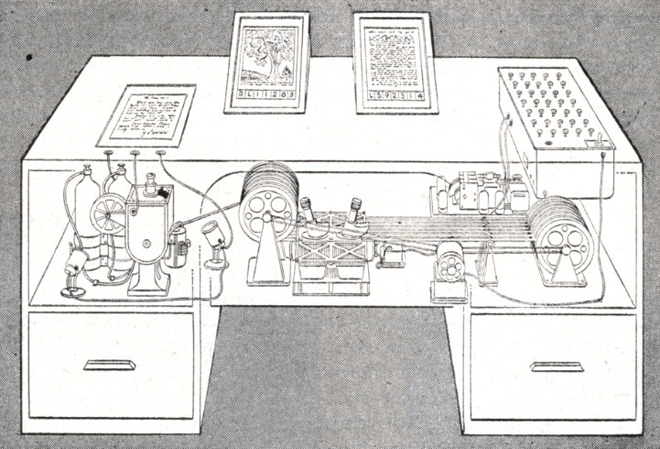 When telling the history of HCI, Vannevar Bush and his vision of the Memex are a very good place to start. Bush was one of the most influential engineers of his day. An MIT professor, science advisor to both presidents F. Roosevelt and Truman and the director of the Office of Scientific Research and Development, Bush played a major role in the secret wartime development of the computer (Grudin 2012). Beyond his work on the practical development of the digital computer, Bush’s most lasting impact came in the form of an essay published by The Atlantic in 1945 called “As We May Think.” His primary concern was a problem with which we can all relate: how can anyone possibly stay informed on the flood of relevant information being produced around the world? He believed that this problem could be solved in the computer age. In the essay, Bush describes his vision of a futuristic personal workstation—the Memex—that would allow trained professionals to better organize, catalogue, recall and share their work via an indexed and linked system of microfilm (Bush). While the essay never used the term, the Memex is widely considered to be the first described hypertext system (Baecker; Myers). In short, the Memex was a victim of the exact problem the system was designed to solve. While the Memex never existed as a functioning product, it had an enormous impact on the field of HCI as one of the first public visions of a computer system that could be useful as more than just a giant calculator. Bush’s vision influenced an entire generation of researchers who would go on to lay the foundation of HCI as a field of study. However, it would take nearly 20 years for researchers to bring many of his ideas—the functional workstation, hypertext system, a visual display, etc.—to life. The two decades that followed Licklider’s “Man-Computer Symbiosis” were an exciting time for advances in HCI. The computer, once little more than a room filled with vacuum tubes and flashing lights, had finally matured enough for researchers to begin working on practical applications that might bring Turing’s universal machine into everyday life. A new generation of researchers began to take the first practical steps that would bring to life the visions of Bush and Licklider. Researchers like Ivan Sutherland, Douglas Englebart and Alan Kay would forever change the way humans interacted with computers. While at IPTO, Sutherland also played a direct role in securing funding for Douglas Engelbart at the Stanford Research Institute (Grudin 2012). In 1962, Engelbart published his seminal paper “Augmenting Human Intellect: A Conceptual Framework” in which he outlined the research agenda that would take practical steps to bring the concepts and aspirations expressed in Licklider’s “Man-Computer Symbiosis” to life. Eventually, his work would lead to NLS system described at the beginning of this essay. In the paper, Engelbart fully embraces the ambition of his project: “By ‘augmenting human intellect’ we mean increasing the capability of a man to approach a complex problem situation, to gain comprehension to suit his particular needs, and to derive solutions to problems.” (Engelbart) Engelbart acknowledges that his work follows in the footsteps of Bush’s MEMEX and seeks to improve upon its offerings while also bringing such a system to life. As mentioned earlier, the NLS built to meet Engelbart’s specifications included the first instance of functional hypertext “support[ing] creativity and problem-solving in teams” (Baecker); the first use a mouse as a cheap input device to replace the more expensive and difficult to use light-pen utilized in other systems such as Sketchpad; the first instance of windows to integrate text, graphics and video content on a single display; the first instance of networking computers for collaborative use by multiple operators across space; the first instance of a word processing application (including basic functions such as cut, copy and paste) laying the ground for all future work in this area; the first instance of “view control,” switching between multiple representations of the same data at the user’s command; and more (Myers; Grudin 2012; Manovich 72-75). More symbolically, Engelbart’s research marked a migration of important HCI research from its traditional home on the East Coast (in laboratories at MIT, Harvard, BBN and elsewhere) to the West Coast, which remains the center for computer technology development today (Grudin 2012). Like Bush’s MEMEX, which never came to fruition for various predictable reasons, Engelbart’s NLS soon faded to obscurity after the 1968 “Mother of All Demos.” While Engelbart was concerned with human factors in design, he was more interested in improving efficiency for skilled users and not necessarily systems designed for general use—a distinction that ultimately cost him funding: “Use of Engelbart’s systems required training. He felt that people should be willing to tackle a difficult interface if it delivered great power once mastered…His demonstration become something of a success disaster: DARPA was impressed and installed NLS, but found it too difficult.” (Grudin 2012) It would take another visionary researcher, years of development and yet another paradigm shift in computing technology before the general user could enjoy the benefits of a system that encompassed Engelbart’s vision of augmented intelligence. In 1969, while Engelbart’s work at the Stanford Research Institute was winding down, Alan Kay was finishing his Ph.D. thesis at the University of Utah. Working with Ivan Sutherland, who helped found the influential computer graphics department at the University of Utah in 1968 following his stints at the IPTO and Harvard University, Kay proposed the idea of overlapping windows as a way to manage different visual elements and applications on a computer display—furthering the ideas that Engelbart had pioneered with the NLS (Myers). After completing his degree, Kay moved on to the newly established Xerox PARC, where he directed the Learning Research Group. Over the next decade, the Learning Research Group pioneered further advances into the graphic user interfaces (GUI) Engelbart and Sutherland made use of in the NLS and Sketchpad, refined the mouse as a practical input device and defined other key features of the personal computer paradigm (Manovich 57). In the early 1973, these ideas came together in one of the first personal computers: the Xerox Alto (Myers). While not a terribly impressive machine, and never really marketed as a consumer product, the Alto was a big step in the direction of personal computing. Kay’s most important contribution to the field of HCI would come a few years later, when he unveiled his vision of the DynaBook in an essay titled “A Personal Computer for Children of All Ages.” In the essay, Kay sets out to describe a tool that can augment and enhance learning for children—and ultimately be used for the benefit of everyone. 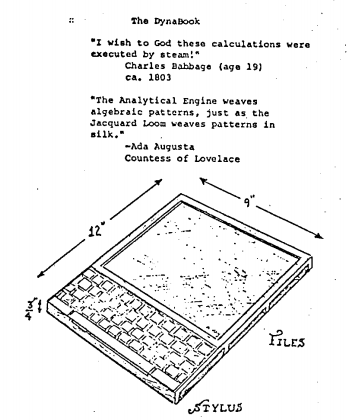 He imagines a medium that is active, attention grabbing and flexibly controlled by the user: “It can be like a piano: (a product of technology, yes), but one which can be a tool, a toy, a medium of expression, a source of unending pleasure and delight…and, as with most gadgets in unenlightened hands, a terrible drudge!” (Kay) The essay is filled with lighthearted asides and fanciful descriptions, giving it a unique charm, but also portrays a powerful device that fits many of the conventions of personal computing we are all familiar with today. As envisioned, the DynaBook is a portable, flexible and powerful personal computer that could be used for many different purposes—for consuming and producing multimedia; recording information via a keyboard, stylus or voice recognition; “what you see is what you get” (WYSIWYG) document editing; sharing information via removable physical memory or by connecting to the burgeoning networks in development at the time; and much more (Kay; Manovich 57). It easily handles all needed computation, allows its user to create rich media content and allows for the easy storage, recall and sharing of information. He ends the essay with various technical specifications and extrapolations from contemporary components, showing the seriousness of his intentions with the device and his belief that it could become a real consumer product (Kay). In the book Remediation: Understanding New Media, authors Jay David Bolter and Richard Grusin describe the concept of remediation as the way in which one form of media can be represented in another form of media (Bolter and Grusin). This concept accurately describes what Kay and his colleagues created at Xerox PARC. Essentially, Kay’s group set out to create a “metamedium” that could represent all forms of existing media on one display (Manovich 65). While the new computational medium they created had many unique properties not found in pre-existing forms of media (unparalleled flexibility, dynamic linking between and within content, etc. ), the beauty of the graphical user interface as conceived at Xerox PARC was that it represented familiar concepts on the computer display. Users could locate and interact with familiar visual icons that represented the programs they wished to use. Users didn’t have to understand the underlying computations to create and edit a text document or to make a painting. In short, Kay and his team were seeking to fulfill the promise of Sutherland’s Sketchpad by creating a graphical communication system between humans and computers that could be easily interpreted by the average user. The history of HCI can largely be seen as a series of successes: theorists outline research agendas that open up new avenues for computer interaction; researchers achieve these goals and more; and consumers benefit. For instance, the Memex envisioned by Vannevar Bush, while undoubtedly revolutionary for its time, is surpassed in functionality and power by the laptop on which I am currently writing this essay. J.C.R. Licklider’s ideas outlined in “Man-Computer Symbiosis” have largely been realized, in part enabled by exponential improvements in the computing speed, memory organization and memory capacity requirements he highlighted as key roadblocks to fulfilling his vision. In fact, in many applications from word processing to CAD, the relationship between humans and computers is much as Licklider envisioned it should be half a century ago: humans supply creative inputs, computers error check and the resulting work is better than it would have been had either acted independently. In theory, I should have no misspelled words in this essay thanks to Microsoft Word’s built in spell checking. While Doug Engelbart’s research agenda was more detailed and his aims more ambitious, much the same can be said about his concepts about computer augmented intellect. While we certainly still have much room to improve the efficiency and efficacy of our interactions with computers, compared to the era in which these visionaries worked computing has vastly improved both the work and play environments for humans. Similar success can be claimed by Ivan Sutherland and Alan Kay. The proliferation of computer graphics and the GUI have forever changed the manner in which humans interact with computers. Direct manipulation systems have been pervasive since computers became a mainstream consumer product. And while the form factors of computers have continued to shift with the advent of mobile phones and tablets, in many ways we still live in the computing paradigm created by the vision of Alan Kay and his colleagues at Xerox PARC. Despite all this, there are still interesting research questions from these early HCI visionaries that remain unanswered today—or if not unanswered, then the potential for the current answers to be improved upon is readily apparent. While changing technology leads to changing research questions (for instance, while the initial need for more operator friendly interfaces is still relevant to HCI today, researchers no longer need be concerned with punched note cards or lever inputs), and many researchers have already started looking forward to questions unimagined by pioneers like Bush, Sutherland and Kay, there are interesting unresolved questions that have great potential to benefit all computer users. In the past decade, some researchers have proposed using the concept of distributed cognition (“extend[ing] the reach of what is considered cognitive beyond the individual to encompass interactions between people and with resources and materials in the environment” (Hollan, Hutchins and Kirsh 175)) as a new theoretical framework from which to approach the research agenda introduced by pioneers such as Bush, Licklider and Engelbart. Proponents of this theory believe that the perspective of distributed cognition helps to break the HCI paradigm that accentuated individual cognition (exemplified by the PC) and to allow for the creation of new, human centered systems as we enter the age of ubiquitous computing (Hollan, Hutchins and Kirsh 175). In the field of Artificial Intelligence research, companies such as Google and Facebook are experimenting with an approach called “deep learning,” which seeks to mimic human neural networks in order to better organize the flood of information available in today’s computational environments (Simonite). These and other emerging trends offer interesting possibilities for new improvements to the intellect augmentation research agenda. Another area of research with many possibilities for future gains involves the language used to communicate with computers. In one-way or another, all the theorists featured in this essay sought to tackle this issue. 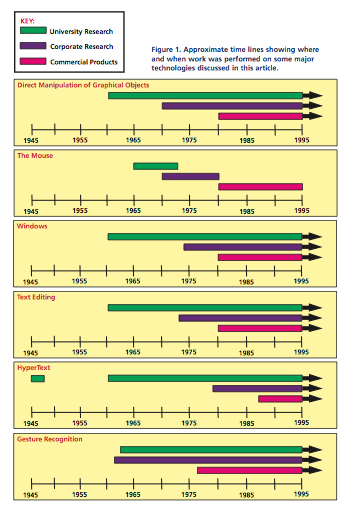 From Ivan Sutherland’s pioneering work with Sketchpad to Alan Kay’s revolutionary SmallTalk programming language—an early language designed at Xerox PARC in which many of the groundbreaking media creation programs were built—easing the process of creation in a computational environment has long been a focus of HCI research (Manovich 98-100). In “Man-Computer Symbiosis,” Licklider outlined what he called “The Language Problem” as follows: “In short: instructions directed to computers specify courses; instructions directed to human beings specify goals.” (Licklider) It is this gap that we are still attempting to bridge. While great progress has been made in this area with the development of high-level languages and software applications that hide the grunt work of code behind a wall of visual representation, there is still much room for improvement to be made in this area of HCI if the average user is to enjoy the full benefits of computational environments. There is also the question of input and output systems, another area of focus shared by all the pioneers discussed in this paper. While we’ve come a long way from the days of interpreting flashing light bulbs or mechanically punched notecards, our existing interactive interfaces leave much to be desired. For most consumers, computer interaction is still constrained by the tools developed or refined at Xerox PARC in the 1970s: a bit-mapped display, the QWERTY keyboard and a point and click mouse (Manovich 99). While the emerging mobile computing paradigm is quickly changing some of these dimensions, the input/output limitations described by Ivan Sutherland in his essay “The Ultimate Display” still largely apply today. However, researchers around the world are working to tackle many of these issues. An end to Sutherland’s longing for a better “looking glass into a mathematical wonderland” might be around the corner. Sutherland’s vision of an immersive world launched the field of Virtual Reality and Augmented Reality research that continues today. 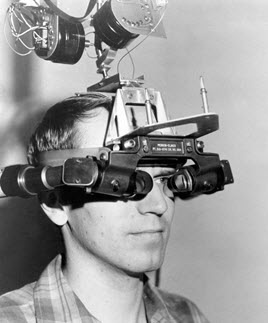 His pioneering work with the Sword of Damocles ushered in the head-mounted display paradigm. While head mounted displays have largely been the stuff of research labs, they are beginning to break into the mainstream. Products such as Google Glass and the Oculus Rift are bringing Augmented Reality and Virtual Reality head mounted displays into the hands of consumers for the first time (Parkin). Accessories such as the Xbox Kinect and the Virtuix Omni are opening up new avenues for natural gesture recognition to further enhance the virtual environment. While systems of these types have existed in research labs for years, their availability on the consumer market at reasonable price points can potentially signal the beginning of another paradigm shift in how humans experience and interact with virtual space. Other unresolved issues pointed out by Sutherland, such as digitizing and reproducing the sense of smell, are also receiving new research interest (Digital Olfaction Society). At the same time, researchers such as Mark Weiser and Paul Dourish have pushed back against the pull of virtual worlds, instead nudging HCI in the direction of “embodied virtuality.” This concept seeks to create an environment in which computers melt into the background, creating the invisible infrastructure supporting human interaction (Weiser). Ultimately, both models of HCI research are worth pursuing, offering different affordances for different activities and uses. New research into this area is leading to groundbreaking possibilities for input and output systems. Some consumer products, such as the MYO armband, are attempting to take advantage of this concept as a new means of computational control (Metz), and other research into this area is exploring the ability of mental control over virtual constructs, though most experiments are in the very early stages (Young 2013). However, a far more interesting application can be found in the development of prosthetic limbs. Not only are patients in experiments now able to control prosthetic limbs in new and improved ways using their thoughts (Young 2012), new techniques are also introducing the possibility that these artificial limbs might return sensations of touch to the patient (Humphries; Talbot). The implications for improving the quality of life are breathtaking. I can only imagine that Bush would approve. The field of HCI has taken great strides since its birth in the middle of the 20th century. The research undertaken by the discipline’s foundational thinkers such as Vannevar Bush, J.C.R Licklider, Ivan Sutherland, Douglas Engelbart and Alan Kay has had a profound and lasting impact on society in the computer era. And there are many areas of the field—both old and emerging—left uncovered in this essay. My hope is that this exploration of important research topics, achievements and emerging trends has shed some light on the field of HCI—where it’s been and where it might go in the future. Bolter, Jay David and Grusin, Richard. Remediation: Understanding New Media. Cambridge, MA: The MIT Press, 2000. Engelbart, Douglas. “Augmenting Human Intellect: A Conceptual Framework.” Augmenting Human Intellect: A Conceptual Framework. Web. <http://www.dougengelbart.org/pubs/augment-3906.html-with-computer-graphics-pioneer-ivan-sutherland/>. Grudin, Johnathan. “A Moving Target—The Evolution of Human-Computer Interaction .” Human-Computer Interaction Handbook (3rd Edition). Web. <http://research.microsoft.com/en-us/UM/People/jgrudin/publications/history/HCIhandbook3rd.pdf>. Grudin, Johnathan. “Why Engelbart wasn’t given the keys to Fort Knox: revisiting three HCI landmarks.” ACM interactions 15.5 (2008): 65-67. www.interactions.acm.org. Web. 2 Dec. 2013. Humphries, Courtney. “Giving Prosthetics a Sense of Touch.” MIT Technology Review. 6 Oct. 2011. Web. <http://www.technologyreview.com/news/425664/giving-prosthetics-a-sense-of-touch/>. Manovich, Lev. Software Takes Command. New York: Bloomgsurry. 2013. Print. McCracken, Harry. “A Talk with Computer Graphics Pioneer Ivan Sutherland | TIME.com.” Time. Web. <http://techland.time.com/2013/04/12/a-talk-with-computer-graphics-pioneer-ivan-sutherland/>. Metz, Rachel. “An Armband Promises a Simpler Route to Gesture Control.” MIT Technology Review. 26 July 2013. Web. <http://www.technologyreview.com/news/517176/an-armband-promises-a-simpler-route-to-gesture-control/>. Parkin, Simon. “Can Oculus Rift Turn Virtual Wonder into Commercial Reality?.” MIT Technology Review. 7 Oct. 2013. Web. <http://www.technologyreview.com/news/519801/can-oculus-rift-turn-virtual-wonder-into-commercial-reality/>. Simonite, Tom. “AI Effort to Find Meaning in Your Posts.” MIT Technology Review. 20 Sept. 2013. Web. <http://www.technologyreview.com/news/519411/facebook-launches-advanced-ai-effort-to-find-meaning-in-your-posts/>. Sutherland, Ivan. Sketchpad: A Man-machine Graphical Communication System. Jan. 1963. Tech. no. 574. Republished by: University of Cambridge, 2003. Web. <http://www.cl.cam.ac.uk/techreports/UCAM-CL-TR-574.pdf>. Talbot, David. “An Artificial Hand with Real Feelings.” MIT Technology Review. 5 Dec. 2013. Web. <http://www.technologyreview.com/news/522086/an-artificial-hand-with-real-feelings/>. “Welcome to the 2nd DOS World Congress 2014.” Digital Olfaction Society. Web. 2 Dec. 2013. <http://www.digital-olfaction.com/>. Young, Susan. “Brain Chip Helps Quadriplegics Move Robotic Arms with Their Thoughts.” MIT Technology Review. 16 May 2012. Web. <http://www.technologyreview.com/news/427939/brain-chip-helps-quadriplegics-move-robotic-arms-with-their-thoughts/>. Young, Susan. “Monkeys Drive Two Virtual Arms with Their Thoughts.” MIT Technology Review. 6 Nov. 2013. Web. <http://www.technologyreview.com/view/521471/monkeys-drive-two-virtual-arms-with-their-thoughts/>. This entry was posted in Final Projects on December 14, 2013 by Zach Schalk.